The social and economic fate of a region depends on the quality and quantity of education and training available to its inhabitants. In Emilia-Romagna has been created an educational and training infrastructure for development called ER Education and Research Emilia-Romagna. The infrastructure plays a key role in the promotion of skilled jobs and sustainable growth. Inclusive because accessible to everyone, the various branches of the infrastructure have the same overall objectives, based on complementary specialisations, the integration of educational institutions, collaboration with enterprise, and syn­ergy between European, national and regional resources. 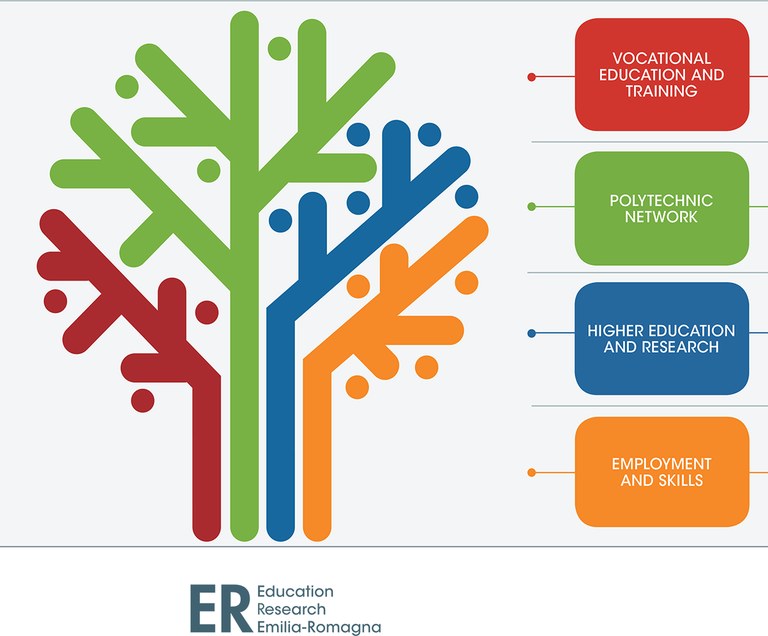 The ER Education and Research Emilia-Romagna is made up of four branches: Vocational educa­tion and training, the Polytechnic network, Higher education and research and Employment and skills. Each of these branches has specific educational objectives. The objective of the educational and training infrastructure is to provide people and the region with strategic knowledge aimed at specialisation, internationalisation, and social, organisation­al and economic innovation. In addition to these priorities cutting across the planning of all actions, an Active Labour Network is being constructed. Together with the Regional Employment Agency, it will become the mainstay of a new generation of active policies able to meet the needs of individuals and businesses. Priority is given to people, their rights, aspirations and skills. This decision was shared in the Labour Pact, signed on 20 July 2015 by the Region, local authorities, unions, business organisations, the third-sector forum, the universities and the Regional Education Office. The legislative pact is meant to guide our actions and all public and private investment in work and growth.